Humanscale Freedom Chair Retrofit Armrest Kits allow you to backfit and upgrade your armrest game with one simple set. The Freedom Chair Retrofit Armrest Kit is designed to fit on the Humanscale Freedom Chair for a more customized feel to your ergonomic seat, upgrading your standard armrests to advanced armrests, and giving you width and height adjustability in the arms. With the addition of these armrests, comfortable work is just around the corner. 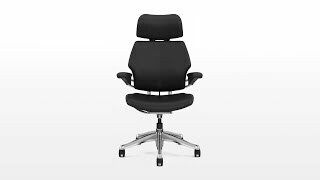 Choose Duron or Gel when adding retrofit armrests to your Humanscale Freedom Chair. Arm supports are available in either graphite or titanium finish. Graphite is darker, closer to black. Titanium is more of a silvery metallic. These arms are better than the originals that came with the chair. Wish I could get a new seat pan cushion in the same material. Parts are final sale items, and no returns will be accepted on parts orders. Please contact us prior to ordering to confirm compatibility. Please refer to our return policy for more information. $205.00 List Price: $215.00* The list price is the same as the MSRP (Manufacturer's Suggested Retail Price). It may not necessarily be the price at which the product is sold.